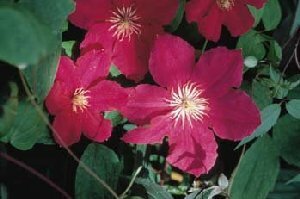 Ernest Markham Clematis: large plant with dusky pink flowers. buildings in a single bound? Look no further! At 10 to 15 feet tall, Ernest is a bruiser! Dark pink flowers adorn vigorous vines through the summer.